Entering Nebraska Lottery contests online at nelottery.com is easy and only takes a few minutes. Most contests require an MVP Club account to enter. Specifically, contests where you submit ticket numbers require that you are logged in the MVP Club to enter your tickets. If you are not a member yet, click here to sign up for the MVP Club. It's free, and provides many additional benefits. After logging in to the MVP Club, click on the "Contests" button to view and select contests to enter. Scratch ticket contests require the entry of the ticket serial number from the back of the ticket and the four boxed digits under the latex on the front of the ticket. Do not enter any dashes or extra characters in the contest form. 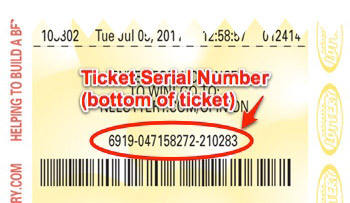 Lotto ticket contests require the entry of the ticket serial number above the barcode at the bottom of the ticket. Do not enter any dashes or extra characters in the contest form. Ticket serial numbers may only be entered once in a contest. If you have any problems entering a contest, contact the Nebraska Lottery at lottery@nelottery.com. * Copyright 2003-Present, Nebraska Lottery. All names, logos and information contained within these pages are meant for personal use only and may not be reproduced or distributed without the expressed written consent of the Nebraska Lottery. Winning numbers are updated daily immediately following the drawings. Other pages on this site are updated periodically. Efforts are made to ensure accuracy, but the Nebraska Lottery cannot guarantee the information displayed here. Contact the Nebraska Lottery or visit a Nebraska Lottery retailer for actual winning numbers. In the event of a discrepancy between the information contained on these pages and the official winning numbers list, the latter shall prevail.